CRC Self Help is mandated under the SHRA to provide rent-geared-to-income affordable housing to the hardest to house. We provide housing to single homeless people, youth, women fleeing from abusive situations, people with chronic mental health issues who can live independently, newcomers to Canada, people with developmental and/or intellectual challenges who can live independently, people with a history of substance abuse and/or addiction and people who are re-entering the community after incarceration. The majority of our resident population qualifies for rent-geared-to-income assistance because they are on a fixed income such as Ontario Disability Support Plan, Ontario Works or Canada Pension Plan. 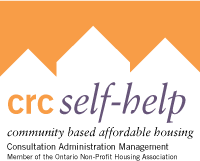 Many CRC Self Help residents are referred to us by other agencies such as hostels, treatment centres, shelters, drop-in centres and halfway homes, as well as walk-ins or referrals from current or past residents. *As per the Ontario Human Rights Code, Part I, Section 4 (1): Every sixteen or seventeen-year-old person who has withdrawn from parental control has the right to equal treatment with respect to occupancy of and contracting for accommodation without discrimination because the person is less than eighteen years old. CRC Self Help manages it’s own independent internal waiting list. Applicants are encouraged to fill out an application to be placed on our wait list. Applicants are also encouraged to fill out an application with Housing Connections. It is important that you ensure that your contact information is kept up to date at all times. Please read the Home Life section to see if CRC Self-Help homes are a fit for you and your goals in life. What happens with your application when you apply for housing? Your application will be entered into the waiting list database within two business days, and will be reviewed by a facilitative housing worker. When a vacancy becomes available, a housing worker will contact you at the number listed on your application form. You must respond to this call within three business days. It is important that you ensure that your contact information is kept up to date at all times. If you were contacted and we did not receive a response from you within the three-day period, we will then move on to the next applicant on the waiting list and you will have lost your opportunity for this vacancy. The housing workers will then contact the next set of applicants. Should you happen to call after this period you will be placed at the bottom of the current batch of applicant contacted. Please note that you get up to three housing offers. Once you refuse all three offers, your name will then be placed at the bottom of the waiting list. Once housed with another housing provider, you will be remove from CRC Self Help waiting list. Your application will become Inactive after 24 months from the application date. After the 24 months, your application will be placed on Hold for a one-year period. You will have to Re-Apply for housing after three years from the date of your application if you have not been in contact with us during this time. If we continue to get no response from you, your Application will be Destroyed after 4 years from the application date.